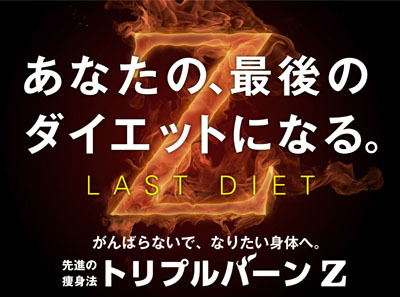 On March 1st (Wed), Miss Paris Group Co., Ltd. (head office: Ginza, Chuo-ku, Tokyo, Representative Director: Akemi Shimomura), started the new service, 'Triple Burn Z Slimming Method', a new body-slimming program, at all it's salons including 'Aesthetic Miss Paris' and 'Men's Aesthetics Dandy House'. This program is based upon the concept of 'Revolution of Physical Constitution! The Ultimate Diet'. It is said that obesity is closely related to one's health and can be the cause of lifestyle-related diseases such as cancer, cerebrovascular diseases and diabetes. A national consciousness towards health and diet awareness has been on the rise in Japan. Specialist health checkups relating to metabolic syndrome and obesity prevention have started to become increasingly popular. Government-approved foods for specified health use called 'tokuho', which is to prevent obesity and promote health, have been attracting a lot of attention. The number of those who visit fitness clubs has been increasing, and the availability of low-carb foods is increasing. 'Rebound' is the problem which many people on a diet fall into and has negative impacts upon their health. 'Triple Burn Z Slimming Method' will minimize the possibility of a rebound and this is a important key to a successful diet. It helps you not only lose weight, but also improve the constitution of your body by preventing the amount of fat from increasing. It is a body slimming program that will lead you to a healthy and beautiful body. It is important to understand the critical role that the aesthetician plays in guaranteeing success of your diet to be safe, infallible, and in timely. Aestheticians with a 'professional license for diet' have been assigned to our salons. They are knowledgeable about aesthetic technology, dermatology, dietetics, and the mechanism of gaining and losing weight. We commit ourselves to help as many clients through 'Triple Burn Z Slimming Method' as possible to realise weight loss easily, and assist them to live a healthy and rich life. (*) In regards to the verification of our conventional program commenced in 2004, 'Triple Burn Slimming Method'. Kokushikan University Graduate school of Sports System has verified that the motional effects of 'Triple Burn Slimming Method', employed while you remaining reclined, consumes the amount of energy equivalent to that consumed by approximately one hour of aerobics. Specialising in the field of 'diet' since its founding, it is the ultimate culmination of the very DNA of Miss Paris Group, an ultimate diet method. "We earnestly hope that even one more client will be able to lose weight easily, and enjoy living a healthy and rich life." With this hope in mind, we have integrated the data accumulated since the founding of Miss Paris Group, collaborated with third party organizations and reinforced our menu of treatments. We have integrated the latest information on dieting to produce a program that is sure to provide results. Thorough description of 'Triple Burn Z Slimming Method'!! In order to decrease body fat, the key to a successful diet, we turned our attention to three kinds of fat which are causes of breaking down of proportions. We will jostle and massage cellulite by hand and disintegrate fat using ultrasonic waves, then further enhance fat burning effects by utilizing the motional energy equivalent to that of one hour aerobics. This is the secret to the heightened effects of 'Triple Burn Z Slimming Method'. By activating the bodies natural metabolism, we will lead you to a body that will lose weight in a healthy manner while retaining muscle mass. While grabbing and pulling up cellulite which is cold, hardened and bonded like a pebble, we will jostle and massage to soften it. As a result of Lymph drainage, jostled and softened waste will be become easily carried by the streams of lymphatic fluid and blood to be excreted out from the body. 2. Million waves: Accelerate disintegration of subcutaneous fat by using ultrasonic waves! 500,000 to 1 million micro-waves per second will reach fat deposited in the depths of the body. Further, 'noradrenaline', which is a lipolytic hormone, will be secreted and can be expected to disintegrate fat. The irradiation area of the pad increased 4 times (compared to our companies conventional product), and the range if fat disintegrated is also increased. 3. Fat Burn: Provides you with the motional effects equivalent to that of one-hour aerobics, while you stay reclined (*). This device, an original of Miss Paris Group, acquired the patent (No. 4463506) and has eight kinds of built-in exercise programs aiming at fat combustion. 'Multi-impact 28 System', is an original device by Miss Paris Group, it stimulates 28 areas of muscles and vital points of the body with its precisely calculated and controlled medium-frequency waves. The program mode, developed by Miss Paris Group, causes dynamic muscle contractions, and acupressure effect, that in turn upswing the metabolism. It will also cause lymph drainage and accelerate circulation. The result of these will in turn benefit you with the same effect that you can get from one-hour of aerobics. employed while you remaining reclined, consumes the amount of energy equivalent to that consumed by approximately one hour of aerobics.